Wonder whatever happened to the old dutch mill eatery that was located on Carson Street opposite of where Highway 50 intersected. I remember you could see the windmill shape coming in from Dayton (we actually lived at Sutro). We came to Carson City once a month to buy groceries and ice in 1937 Ford and two wheeled trailer. This was in early 1940s. 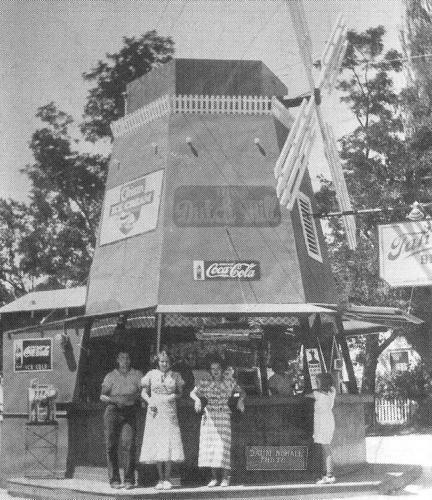 Ate at dutch mill (hamburger, potato chips, and pickle was 15 cents). Got groceries and ice, then parked on street in front of the movie theatre with just a tarp over the trailer. Wouldn’t do that today. Any way wondered if anyone remembers the old Dutch Mill. The Old Dutch Mill was way before my time, but I’ve seen pictures of it, the two above. It was on the site where Heidi’s is now. In fact, Heidi’s sign is in the shape of a windmill, in an homage to the Dutch Mill. I’d love to learn anything more about it. The last time I was in Heidi’s, I was under the impression that they were operating in a remodeled version of the Dutch Mill which had been on that corner during my tenure in Carson City (1953-1966) – the 1950’s photograph depicts the basic shape and window configuration that I remember from my last visit. Is this not the case? Was a brand new building constructed at some time after 1966 to replace the old Dutch Mill? I think the Heidi’s structure is not the same as the Dutch Mill. Too many architectural differences. 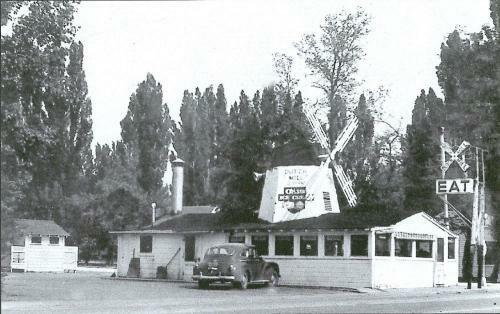 Plus, from the 1950s picture, it looks like the Dutch Mill was right on the corner of Carson and Williams, while Heidi’s is set back with a parking lot out front. I just purchased a vitage lamp that says “Have a drink with Emma and Francis Slade”. My research leads me back to this married couple whom ran this restaurant in the 40’s. Hopefully my research is correct. I worked at the Dutch Mill in 1965 (i think) for Cecil Perrin. 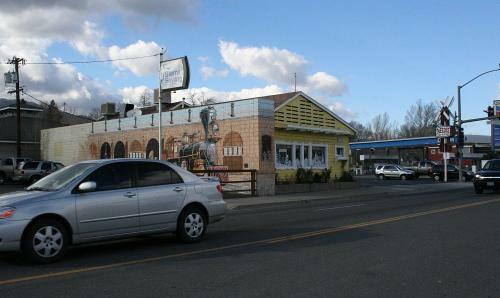 My mother worked at the old Dutch Mill Cafe June 1946 – January 47. She made $1.00 / hr as a waitress. We first stayed at Peppers Court. The rent was $40/wk so we lived? on mom’s tips. She later found us places to stay that cost her less but, still, for her it was a struggle. For many women Nevada was attractive for its short wait to get a divorce, which is why we were there at that time. As short as it was, my brother and I, 11 and 9 yr olds, had many memorable experiences. Carson was so small in population then, about 2,900. Many side streets were still dirt. We walked and rode our bikes all over town including on Carson/Hwy 395 past the Dutch Mill and the Old Mint/ Museum. The Virginia and Truckee Railroad was still operating then. Our dad shipped our bikes to us by rail in 1946.